Our main plant is located on historic Paseo de Oñate Street in Española, New Mexico. This 6000 sq. ft. newly-remodeled plant houses two different types of dry cleaning as well as in house leather cleaning and carpet cleaning. We have laundry capacity of 200lbs/hr. and the capacity to finish all these textiles with the appropriate finish techniques. 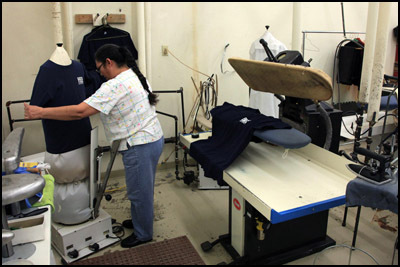 We have a complete tailor shop as well as Ozone facilities and storage available to our customers. © 2016 Mountain Air Cleaners. All rights reserved.